The announcement of MukeshAmbani Chairman Reliance Industries to make Punjab only state in the country to have all villages and all schools linked with 4G broadband network generated much enthusiasm in the technical session and IT&ITES, - fostering entrepreneurship, with delegates discussing new possible openings with 4G connectivity available in every village. The announcement of 4G connectivity changed the discourse of session with every delegate focusing on taking the benefits of IT & ITES to the villages, skilling the village youth with new IT enabled technology, expanding the e-commerce and e-trade network to every village, linking all 1617 agriculture marketing centers that are handling Asia’s biggest procurement process twice a year and making Punjab IT hub of South-East Asia. Sridhar Mitta founder and MD Next Wealth Entrepreneurs with 48 years ofexperience in IT service said that Punjab with highly skilled computer literate human resources backup has potential to generate 2 lakh jobs in IT sector alone in next 2 years. He said that 4G penetration to PAN Punjab rural area would be game changer for the industrial growth of Punjab with every village home becoming a IT module with in next two years. 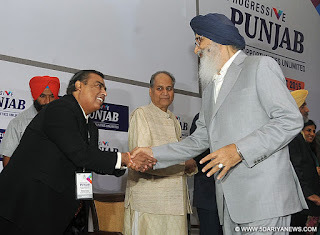 He said that Punjabis have always loved to accept new technology fiddle with it and they would surely create new IT platforms to expend their skills.Mitta said that going by the vision of the Deputy Chief Minister Mr. Sukhbir Singh Badal and new industrial policy of the state, he was sure that Silicon Valley Mohali is allset to surpass Bangalore and Hyderabad in next 2 years, with infrastructure boost in those states already crumbling down. He added that Punjab has all the ingredients of being a perfect IT destination with 740 registered IT units in state and cost of IT service is 20 to 30 percent lesser than the other states of India.Pradeep Gupta CMD Cyber Media Groupsaid that Punjab is an emerging IT &ITeS hub in India. The State possesses a perfect blend of a large pool of skilled technical talent, superior infrastructure and excellent quality of life. Existing ecosystem in the region of large scale IT companies including Infosys, WIPRO, Tech Mahindra, etc. makes it an ideal destination for investments in technology sector. Rajeev Rai CEO and co-founder QA Source,said that the IT, ITeS& BPO industry are considered to be one of the pillars of the economy within the IT industry in the country. The growing mobile penetration, evolving consumer mindset and favorable demographics in India has provided the unique opportunity to fundamentally change the way companies connect with their customers. Government of Punjab is keen to tap this potential and attract private sector players in this space.KS Bhatia the founder of Pumpkart, the online water pump selling, portalsaid thatPunjab has a state-of-the-art Software Technology Park (STPI) in SAS Nagar (Mohali) and Amritsar. In addition, there is an upcoming STPI incubation center of approximately 1.4 lakh sq feet in Mohali to provide enabling ecosystem to the new age startup companies.The session was held in packed hall of the ISB with AkhileshTuteja as the session moderator. Other panel of experts included Rajneesh Aggarwal director Technology Parks of India, and Sanjay Mehta managing director Teleperformance.